Evening Grosbeaks - Now featured and sold at Tree-Free Greetings, Earth Friendly Cards and Gifts! 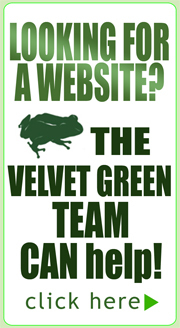 As a Michigan Wildlife Artist I find myself surrounded by mulitudes of wildlife on a daily basis. It was during a winter warm up that I sat in a platic white chair on a hill and watched these playful Evening Grosbeaks fly in and out of the bird feeder in Mio Michigan. We had been visiting our Grandmother and she enjoyed taking care of the birds, squirrels, and deer. These two birds truly stood out. Colorful and strangely brave, they flew directly at me after the sound of the shutter from my camera clicked. I then fell backwards down the hill and amazingly - these were the photos that led to my references for this painting. I also sketch in the field and bird watch to learn about their bodies and flight. Purchase this limited edition print by clicking on the Limited Edition Prints button or visit our Online Fine Art Store and More! 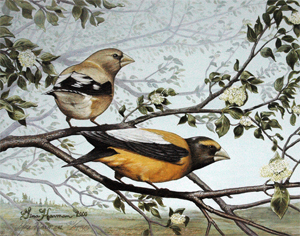 For this painting of Evening Grosbeaks used in the design in greeting cards and more please visit: www.tree-free.com and enjoy my bird art in a variety of products!